Julian Huppert, MP for Cambridge and Joint Chair of the All Party Parliamentary Cycling Group supported a Cycle Safe event on the city’s Midsummer Common recently. He visited a stand set up by the Mineral Products Association (MPA), in partnership with Breedon Aggregates, designed to promote safer cycling to try to reduce road accidents. The event formed part of MPA’s national Cycle Safe campaign which aims to prevent collisions between cyclists and Large Good Vehicles (LGVs) by raising awareness on both side of how to cycle and drive as safely as possible. It took place at the end of the end of the 60 mile Breakthrough Breast Cancer London to Cambridge Bike ride. 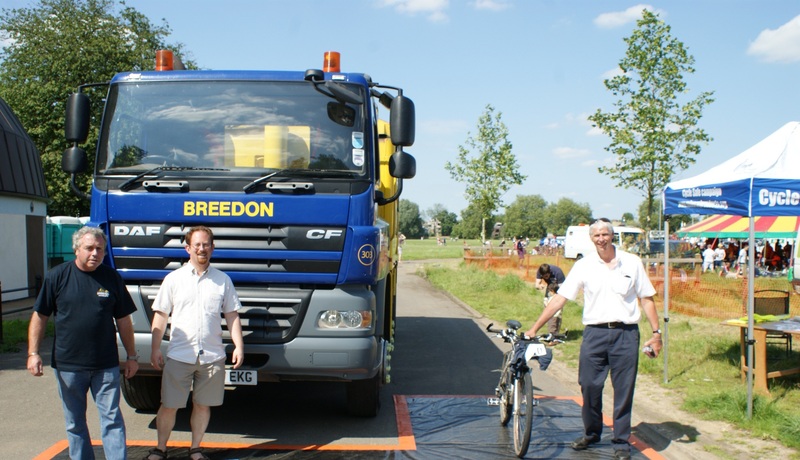 The six hour Cycle Safe event attracted many cyclists who were given the opportunity to sit in the cab of a lorry to understand the driver’s perspective, experience visibility issues and share their own road experiences. Free high visibility vests were given to those that got into the vehicle and Cycle Safe leaflets, highlighting ways to prevent potential dangers, were handed out. Julian said: “Accidents between lorries and bikes can so often be deadly. That’s why MPA’s Cycle Safe campaign to increase awareness between lorry drivers and cyclists is so important. If we’re to save lives it’s vital they’re more aware of each other on the roads. Elizabeth Clements, spokesperson for MPA, said, “We are really glad that so many cyclists were able to visit us on Midsummer Common. With the high number of cyclists in Cambridge, it is a very important location to hold an event and we are planning to run another one during Cambridge University’s Freshers’ Fair. The continuing growth in the number of cyclists, particularly in urban areas, is increasing the risks of collisions between cyclists and motor vehicles. Every year in the UK, hundreds of cyclists are injured or killed in accidents with motor vehicles, including lorries. In 2010, 20 cyclists were killed or seriously injured on Cambridge roads, making Cambridge the constituency with the third highest number of reported casualties outside London*. Cambridge City Council was one of the first to sign up to The Times newspaper’s Cities Fit for Cycling Campaign launched in February 2012.